"It’s a little raisiny, fragrant with spice and bark, suggestive of green walnuts. It’s immensely enjoyable to drink." Tradition attributes to Hippocrates, the Greek physician V century BC, the creation of "herbal wine", the predecessor of the current vermouth. In ancient times it was known for its medical properties and its use became widespread in Europe especially from the eighteenth century. Starting from a base light wine and combined with extracts from various aromatic, bitter and herbal stimulants, this unique and elegant appetizer is obtained. It is made using the traditional method. Intense nose with notes of herbs and light balsamic touches that give us a nice and very unique aromatic structure. Good aromatic intensity on the palate, nicely balanced with acidity, long and intense aftertaste. Our vermouth also links well with soft drinks and juices, achieving combined nice taste and low alcohol. Preferably it is recommended to consume between 8 and 12 º C temperature. 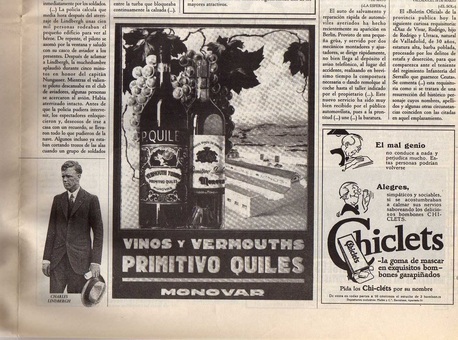 PRIMITIVO QUILES PRESS ADVERTISING APPEARED ON SEPTEMBER 27, 1927 IN "MUNDO GRÁFICO", ONE OF THE MAIN SPANISH PUBLICATIONS OF THOSE YEARS. IN THE FIRST FLOOR HIGHLIGHTS THE BOTTLE OF VERMUT WITH THE SPECIAL DESIGN OF ITS LABEL WE PRESERVE TODAY.